Positive Electrics - Alarms/Security, Electrician based in Old Whittington, Derbyshire. 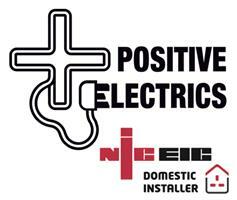 Based in New Whittington (Chesterfield), Positive Electrics provides domestic and commercial electrical services to customers throughout Chesterfield, Dronfield, Sheffield and surrounding areas. Established in 2005, the company has many years of experience in the provision of electrical installation services and repairs. We help customers to become more energy efficient, design bespoke electrical layouts and solve electrical problems in a timely and professional manner. The company provides businesses and individuals with a professional electrical service. With qualified and experienced staff, we comply to the current IET wiring regulations (BS7671, 17th edition) and with building regulations, covering electrical installations in dwellings (Part P building code). Additionally we are experienced in Sensory Room installations, having worked for one of the market leading sensory companies in the UK, Rompa. We can help our customers save money by advising on room layouts, electrical requirements and installing sensory equipment at affordable and competitive prices.